The Palestinian Wisam Salsaa is general manager of The Walled Off Hotel, which is just in front of the wall to which he referred. Israeli construction in the West Bank began in 2004. Thereafter, several regions suffered from the work – they ran out of agricultural regions and some towns were totally isolated. The wall has enormous dimensions: an extension of 721 km, 8 meters in height, barbed wires and numerous surveillance towers. Israel’s intention was fulfilled – to drive Palestinians away from Jerusalem and, consequently, the rest of the world. The construction is the result of an intense dispute that dates back to the mid-20th century. Since the establishment of the State of Israel in 1948, until today, the Jerusalem area has been the scene of endless cultural and identity-based clashes that have triggered massacres, wars and intolerances against the Palestinian people. Despite all these problems, Jerusalem itself and also Bethlehem, a neighboring city – which, according to the Bible, was exactly the birthplace of Jesus Christ – are some of the places most frequented by tourists, receive around 4 million a year if we add the two regions. The Palestinian question has already generated some 5 million refugees, according to United Nations data – most of them live in camps scattered across neighboring countries or in the occupied territories, such as the Aida camp, also in Bethlehem. 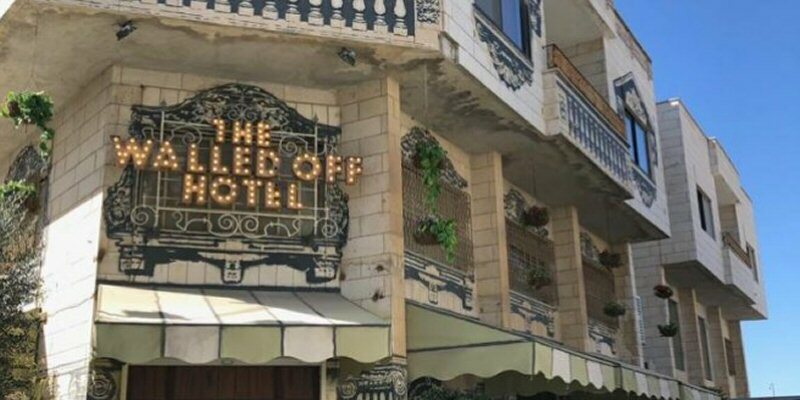 To try to change this situation, and to bring tourists to know the Palestinian reality, the hotel opened a small shop next to the establishment, where it is possible to acquire sprays, graffiti ideas that symbolize peace and freedom in Palestine. Once the purchase is made, the client chooses a space in the wall and makes his own drawing with the help of one of the employees. Shop next to the hotel, which invites visitors to leave their mark on the wall. “English street artist Bansky, famous for his works in various parts of the world, including here on the walls of Palestine, had the idea of ​​opening this shop to connect people in this world that we live through art. In this way, everyone who passes by here knows more about the true history of the war and can still express what he thinks, “said Wisam. The Palestinian calls the project a “physical connection of the foreigner with the war”. And it is not difficult to see that hundreds of them tried the idea of ​​knowing this conflict a little more closely. Some parts of the wall are completely graffiti, all of them with some support for the Palestinian cause. “They have tried to destroy some drawings, especially those involving the president of the United States. But let’s continue with this work, we can not give up showing the world the reality that goes far beyond what is shown in the media, “added the Palestinian. Wisam Salsaa, general manager of the hotel. Hotel in Palestine has decoration and even museum that help the visitor to better understand the Palestinian question.